German rabbi; born at Halberstadt at the beginning of the eighteenth century; died at Düsseldorf about 1770. After studying at Frankfort-on-the-Main under Jacob ha-Kohen (1730), Halberstadt became teacher in the rabbinical school of his native town. 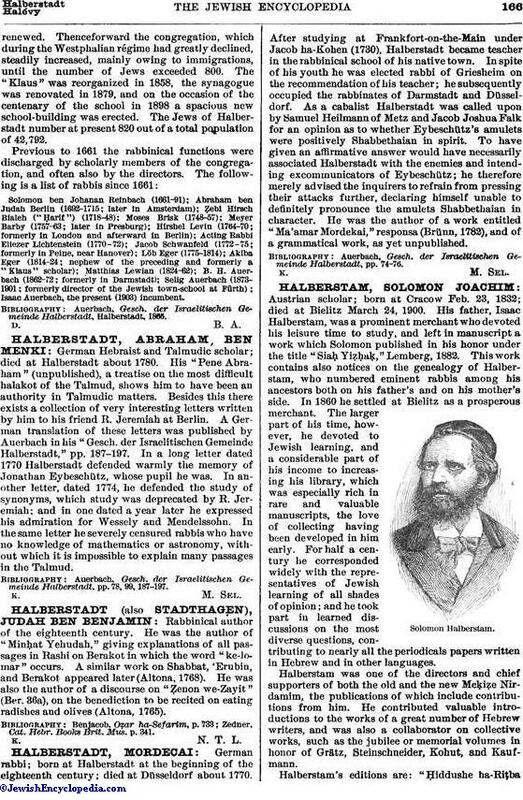 In spite of his youth he was elected rabbi of Griesheim on the recommendation of his teacher; he subsequently occupied the rabbinates of Darmstadt and Düsseldorf. As a cabalist Halberstadt was called upon by Samuel Heilmann of Metz and Jacob Joshua Falk for an opinion as to whether Eybeschütz's amulets were positively Shabbethaian in spirit. To have given an affirmative answer would have necessarily associated Halberstadt with the enemies and intending excommunicators of Eybeschütz; he therefore merely advised the inquirers to refrain from pressing their attacks further, declaring himself unable to definitely pronounce the amulets Shabbethaian in character. He was the author of a work entitled "Ma'amar Mordekai," responsa (Brünn, 1782), and of a grammatical work, as yet unpublished. Auerbach, Gesch. der Israelitischen Gemeinde Halberstadt, pp. 74-76.